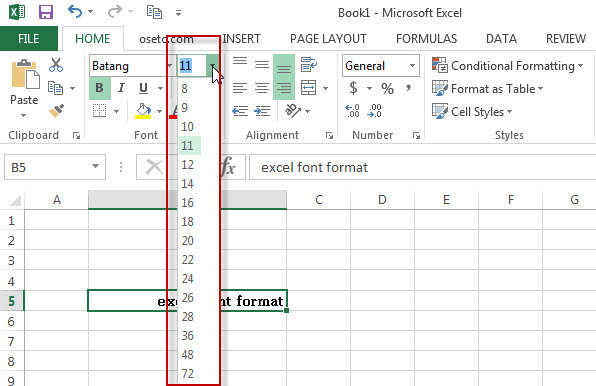 If you want to format excel cells, You can do many things for cells in excel such as: changing Number format, Alignment format, Font format, Border format, Fill format and protection . 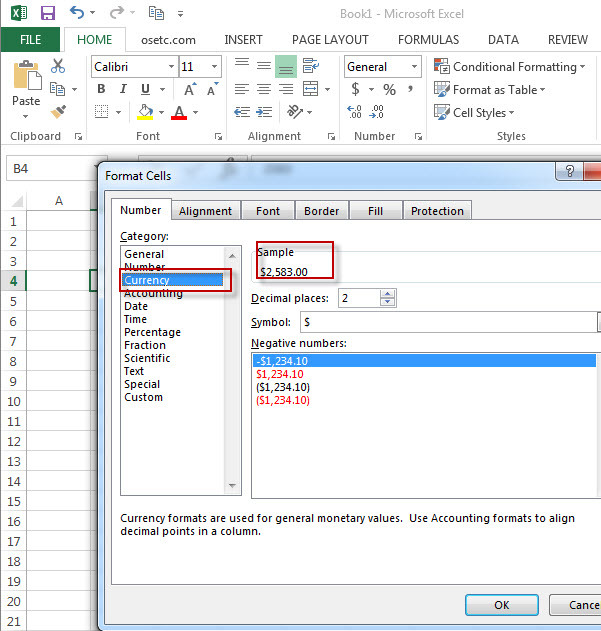 Step 2# select “B4” cell as current cell, then right-click on the B4 cell, click “Format Cells”, then “Format Cells”window appears. 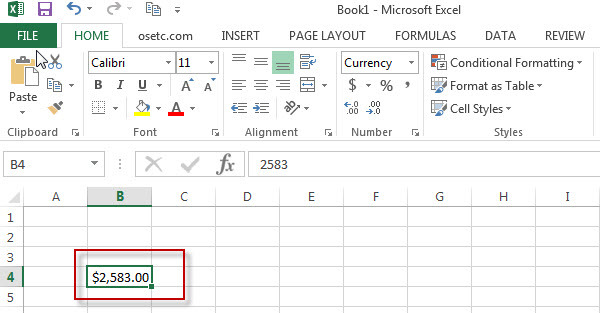 Step 3# Select “Number” tab, then you can select one category in the category ListBox, such as you can select “Currency”, then the value will be formatted as Currency format. 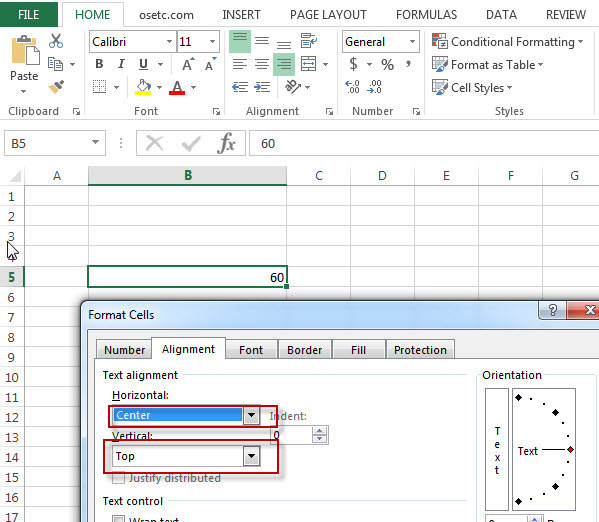 The formatting result will be appear on the “Sample” section on the “Format Cells” window. Step 4# click “OK” button, let see the final result. 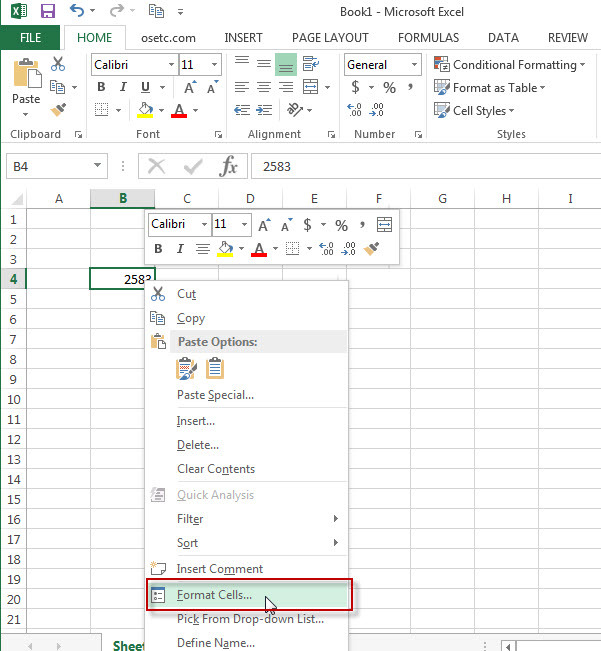 If you want to align the text or content in the cell (top, bottom, center), you can set it in the “Format Cells”window or Alignment group in the Home Tab. 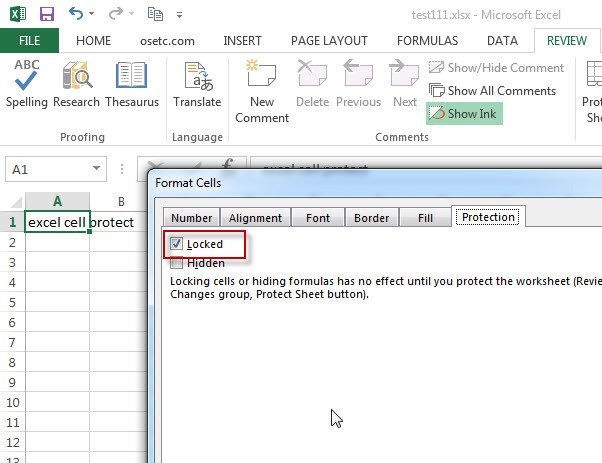 Step 2# righ-click B5 cell and then click “Format Cells” from the popup drop menu. 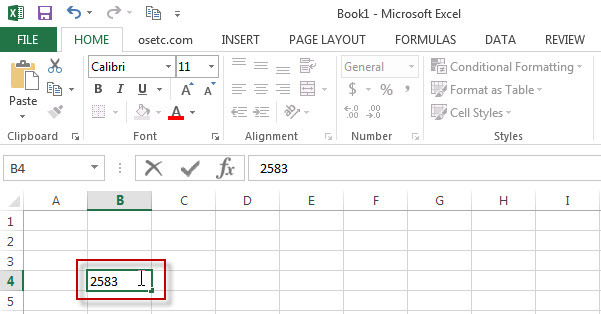 Step 3# select the Alignment tab in “Format Cells” window, then you can change alignment setting via set“top””left””right” or others under Text alignment section. 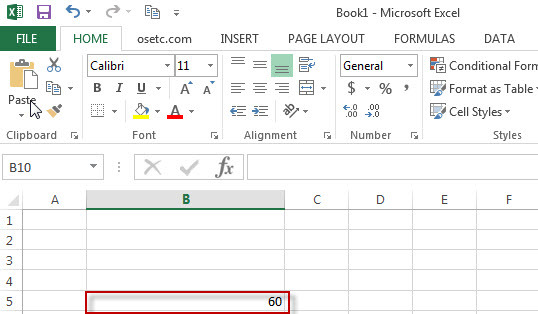 Step 4# click “ok” button, you will see that the text alignment of B5 cell will be align to center position. 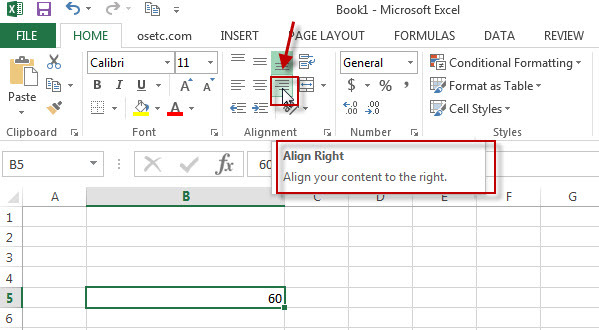 Or you can also change the alignment setting of text via alignment group in home tab. Just clicking the alignment command to align what you want to. 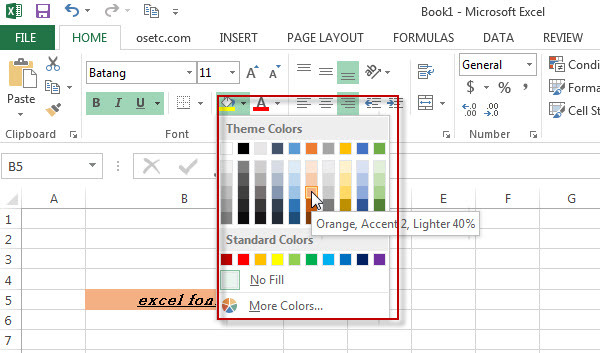 Step 2# To change the Font, just select one font you want to set under Font Listbox. Or click Font Drop-list in the Font group on Home tab. 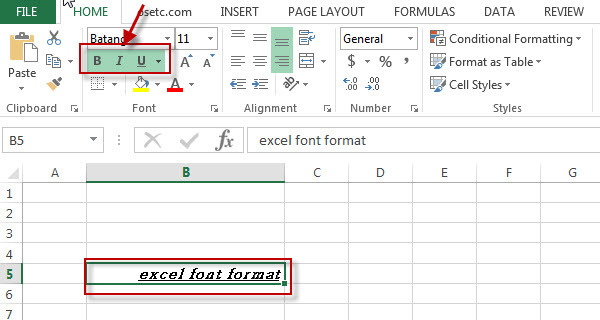 Step 3# To set Font size, just click Font size drop-list in the Font group on the Home Tab or change the font size of text in “Format cells” dialog box. 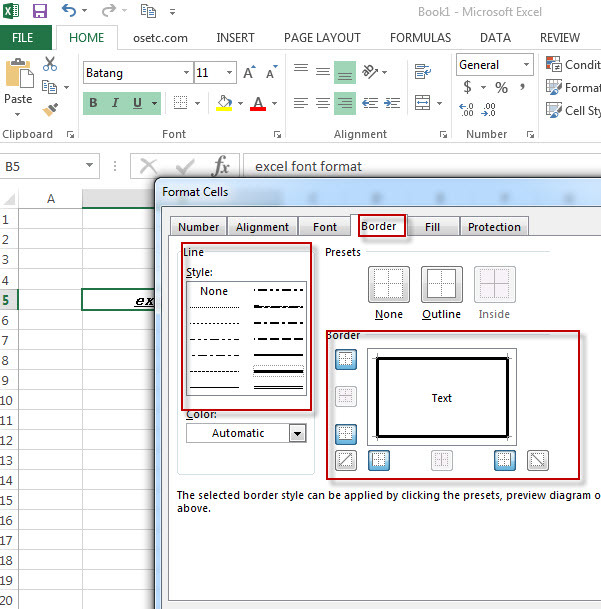 Step 4# There are 4 Font styles that you can set: Regular(default setting), Italic, Bold, Bold Italic. To set Font style, just click “B””I” “U” command in the Font group on the Home Tab. 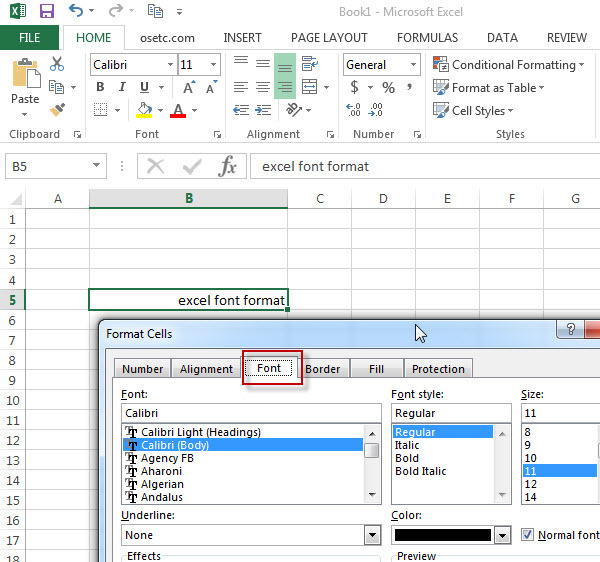 Also can change font style in the “Font” tab of “Format Cells” dialog box. 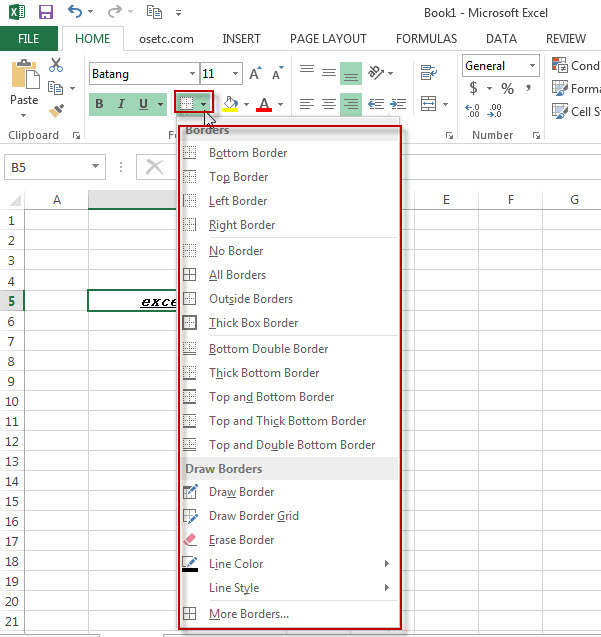 You can draw a border around a cell or range cells. The below steps will show you how to draw a border. 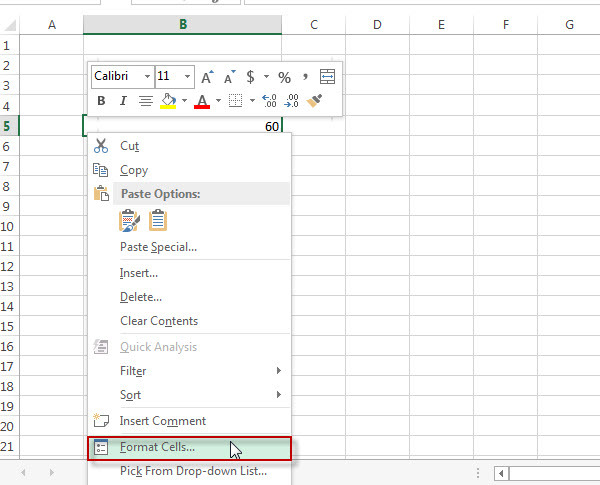 Step 2# select “Format Cells” from the drop list. 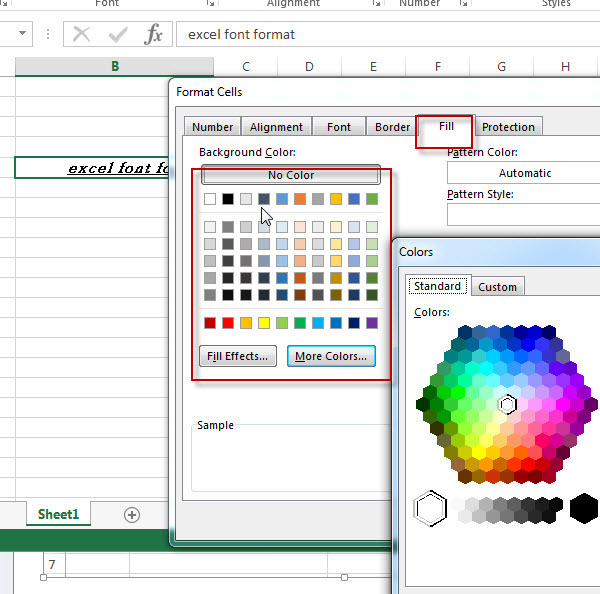 Then “Format Cells” dialog box appears. Step3# select the“border” tab , then select your line style and the borders that you want to draw. 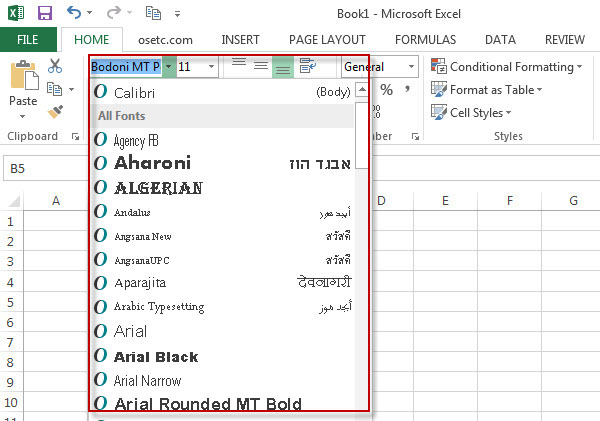 Step 4# you can also click borders drop-list in the Font groups on the home tab. Step 1# select cells or range that you want to protect, Right-click and then click “Format Cells”, “Format Cells” dialog box appears. Step 2# clicking “Protection”tab, just check the “Locked” checkbox. Click “OK” button. 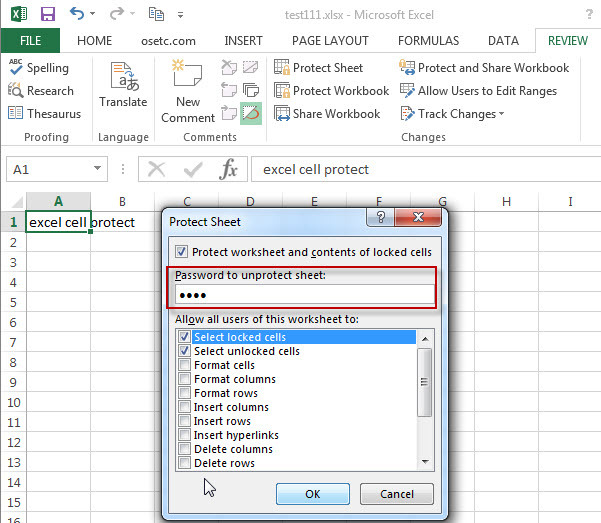 Step 3# Go to “REVIEW” Tab, then click “Protect Sheet” button so that locking of the cells can be take effect. Step 4# “Protect Sheet” dialog box will appear. 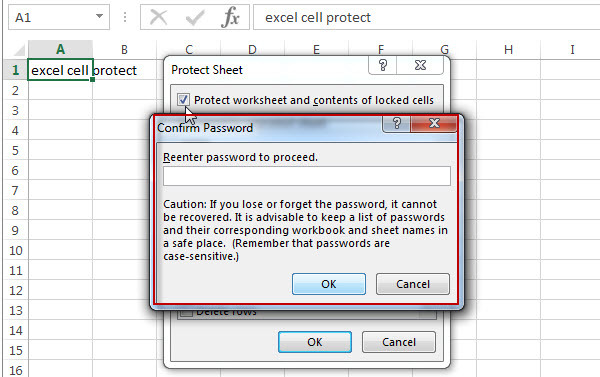 Then Enter one password in the password text box in “Protect Sheet”window. Step 5# Confirmed password need to be input. 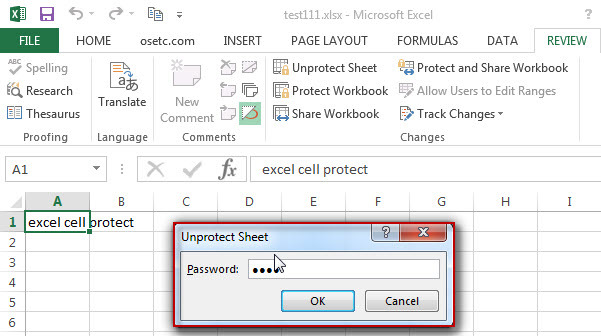 Step 6# At this time, if you want to make changes, you need to click “Unprotect Sheet” button in “REVIEW” tab, then one password need to be input in the “unprotect Sheet” diagbox.